Changing the way business is done around the world. Crestcom International has been a global leader in leadership development for more than three decades. We are changing the way business is done in more than 60 countries, and in more than 22 languages. 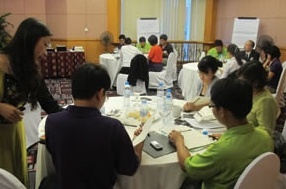 Crestcom delivers interactive learning experiences that help people produce real business results. This results-based learning helps managers become great leaders. Start your own professional services franchise with Crestcom’s proven tools and processes. Crestcom’s Signature program, The Bullet Proof® Manager is one of the training industry’s widely used management and leadership development programs among Fortune magazine’s Top 100 Companies. Each month, thousands of business professionals from across six continents participate in the Crestcom Bullet Proof® Manager training. Our proprietary training is changing the way businesses motivate, communicate and help managers and leaders succeed. Our business consulting training is second-to-none. 98% of our customers report that Crestcom training met or exceeded their expectations. The Crestcom franchise model gives franchise owners the support, training and tools needed to operate their own businesses providing our world-renowned training. Crestcom franchisees feel rewarded by helping others grow professionally and realize success.